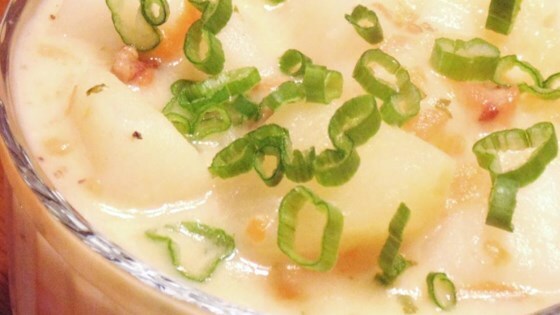 "This creamy potato soup is good any time of the year, but especially in cold weather months. It reheats well and can be made without bacon or cheese. This is filling enough to be served as a main dish, but also makes a nice side soup if served in smaller portions. Feel free to add your own ingredients: other vegetables, seasonings, different cheeses, etc. When serving, some options for garnish are chopped green onions, additional crumbled bacon, shredded cheese, and parsley. Enjoy!" Place cooked bacon in a large stockpot over medium-high heat; add potatoes, chicken broth, carrots, onion, parsley, celery seed, salt, and pepper. Bring mixture to a boil, cover stockpot with a lid, reduce heat to medium-low, and simmer, stirring frequently and slightly mashing potatoes, until potatoes are fully cooked, at least 20 minutes. Add extra chicken broth if needed. Whisk milk and flour together in a bowl or measuring cup until frothy; slowly pour into soup while constantly stirring. Bring soup back to a simmer and cook until soup is thickened, 3 to 5 minutes. Remove soup from heat and stir in American cheese until completely melted. Ladle soup into serving bowls and garnish with green onions. A hearty winter soup with potatoes, Cheddar, and bacon. When cutting potatoes, if you want chunkier soup, make the pieces bigger. If you don't want any pieces left, cut them small. If creamier soup is desired, cook longer until potatoes are mostly broken-down. Colby-Jack cheese can be substituted for the American cheese. Made it exactly as recipe stated except I put actual celery in with the onion and carrots and left out the celery seed. Delicious. Great heated up the next day too. I thought too easy to be so good!! Had some when it was done and heated it up later and it was better. Creamy soup and very easy, used red potatoes and did not bother to peel them. Also used celery (lightly sautéed it with onion in a little butter) before adding broth and potatoes. Very good. Made exactly as it says and we really enjoyed it. The carrots add a different flavor to it and give a different spin on traditional tasting potato soup. Absolutely great! Used grated sharp cheddar cheese instead of American.